Astronomers have used a new advanced camera to analyse a type of ancient star in more detail that ever before. Most telescope cameras can only take a photo every minute or so, but HiPERCAM is a camera capable of taking a colour image every millisecond. Cool subdwarf stars are a very old type of star, but they are also small and dim, meaning it’s difficult to take a good look at them with standard cameras. HiPERCAM has allowed scientists to take the first good images of these stars, giving us measurements of the size, mass and temperature of the same cool subdwarf star for the first time. “We were able to tell that this star is indeed quite a bit smaller than it should be for a normal star of its mass - which is exactly what the theory predicted it should be, but this is actually the first time we’ve been able to tell that for sure,” says Dr Steven Parsons from the University of Sheffield who was involved in the study. The particular star they looked at is in orbit with a second star in what is called an eclipsing binary orbit, aligned to the Earth so that telescopes here can see one star pass in front of the other in an eclipse. Because the stars are in a very fast orbit of only around two and a half hours, until now cameras have not been quick enough to take photos of the eclipses. HiPERCAM is attached to the biggest optical telescope in the world, the Gran Telescopio Canarias in Spain, which uses a 10m mirror to capture enough light to allow the camera to take photos in such a short amount of time. The camera, which takes pictures in five different colours, can be used to work out the star’s temperature, as stars of different temperatures give out different colours of light. For example, hotter stars give out more blue light. 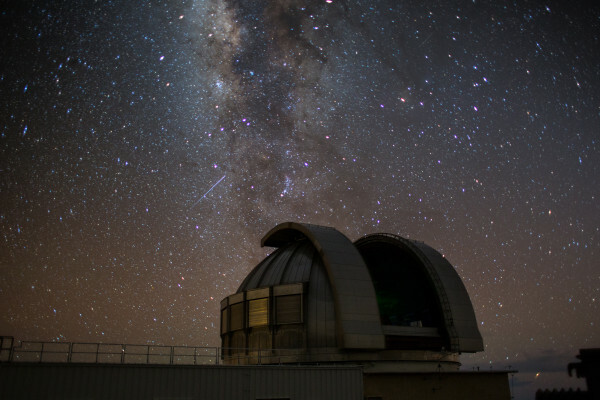 Scientists study the relative ages of stars by looking at what elements they contain. Hydrogen and helium were created very shortly after the Big Bang, around 13.8 billion years ago. Every other element was made afterwards in the early generations of stars. These star-made elements are all called metals by astronomers - even the ones the rest of us don’t think of metals! “The first generation of stars that existed were pure balls of hydrogen and helium. Each subsequent generation of star has a little bit more metal in it,” explains Dr Parsons. The star in this study is at least 10 billion years old and has very little metal in it, making it a very early star. Our own Sun is only about 4.6 billion years old. Studying old low-metal stars such as this one can help to estimate when life might have become possible in the galaxy. The team will continue to use the HiPERCAM to watch this pair of stars for signs of any orbiting planets, by looking for the effect planets would have on the eclipses between the two stars.